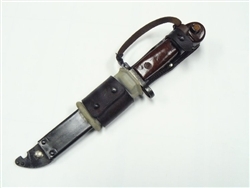 Original Romanian AK 47 Bayonet, originally produced for the Romanian FPK Sniper Rifle. Comes with lanyard, scabbard and insulator. 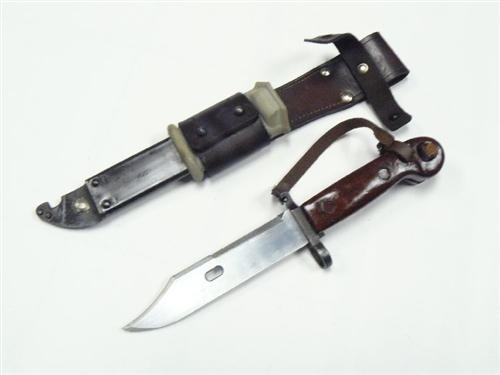 These bayonets are used original surplus items that show some wear and tear. We inspect each bayonet to insure that you are getting the best looking one that we can sell you. The frog is an option that can be included for an additional cost or it can be purchased separately (part # 24544). 5-3/4" Carbon steel blade, 10-1/4" overall length. We also have some of these bayonets that are blemished. They have dents in the scabbard, nicks in the blade or handle, or all of the above. They do NOT come with a frog, lanyard, or insulator. THE BLEMISHED BAYONET IS SOLD AS IS NO REFUND, $7.99. 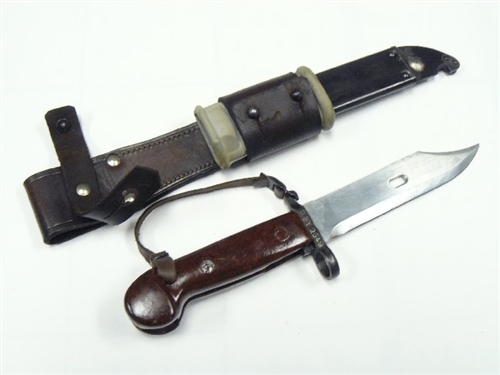 The above picture does not depict the blemished bayonet. CHOOSE YOUR BAYONET FROM THE DROP DOWN OPTIONS ABOVE.